Shangri-la, synonymous with the earthly paradise and mythical Himalayan utopia, always evokes the imagery of blue moon, pyramid like white snow mountains and almost immortal people. We specially designed this itinerary to tour in this breathtaking area and some other enchanting places in Yunnan Province - the "Spring City" of Kunming, Dali - the ancient capital of the Bai ethnic minority kingdom, Lijiang -the heart of UNESCO World Heritage Three Parallel Rivers of Yunnan Protected Areas - Tiger Leaping Gorge, one of the most magnificent canyons in the world. Tourists can enjoy spectacular scenery, folk arts of the ethnic minority people, and cultural relics, explore indulge yourselves in Shangri-la, a mystical paradise lost in the deep mountains. You might view how people there live stresslessly and in moderation. And You might find a peace of mind in the harmonious wonderland of Shangri-La with snow-capped mountains, lakes, trees and water. It is the trip of life, where the souls be purified. * Explore the Tiger Leaping Gorge - Yangtze River roaring under steep 2,000 metres (6,600 ft) cliffs. Zhongdian in the western Yunnan Province was named officially Shangri-La in 2001. Shangri-La is a name that has worked its way into the English language. Synonymous with utopia, the word was first used in 1933, coined by the British author James Hilton in his novel Lost Horizon. Characterized by towering snow-capped mountains, blue moon, lush forests, vast gorges, idyllic lakes, mysterious monastery and immortal people. Shangri-La is described by Hilton as a mystical, harmonious valley, gently guided from a lamasery. It has become synonymous with any earthly paradise, and particularly a mythical Himalayan utopia – a permanently happy land, isolated from the outside world. In the novel Lost Horizon, the people who live at Shangri-La are almost immortal, living years beyond the normal lifespan and only very slowly aging in appearance. The word also evokes the imagery of exoticism of the Orient, arouses a certain curiosity and mystery whenever it is heard. In the ancient Tibetan scriptures, existence of seven such places is mentioned as Nghe-Beyul Khembalung. 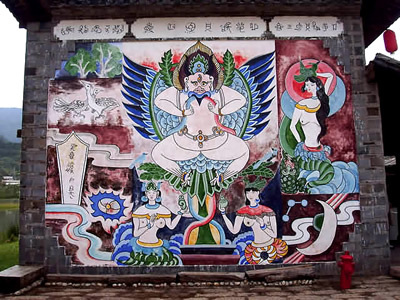 Khembalung is one of several beyuls ("hidden lands" similar to Shangri-La) believed to have been created by Padmasambhava in the 9th century as idyllic, sacred places of refuge for Buddhists during times of strife. The word Shangri-La is also thought the same as Shambhala, a mythical kingdom in Tibetan Buddhist tradition. Consisting of eight geographical clusters of protected areas within the boundaries of the Three Parallel Rivers National Park, in the mountainous north-west of Yunnan Province, the 1.7 million hectare site features sections of the upper reaches of three of the great rivers of Asia: the Yangtze (Jinsha), Mekong and Salween run roughly parallel, north to south, through steep gorges which, in places, are 3,000 m deep and are bordered by glaciated peaks more than 6,000 m high. The site is an epicentre of Chinese biodiversity. It is also one of the richest temperate regions of the world in terms of biodiversity. - by UNESCO website. The Tour in Dali will begin with the visit to the Three Pagoda Temple that faces Erhai Lake. As its name implies, there are three ancient independent pagodas standing in a symmetrical triangle inside the temple. With a history of more than 1,800 years, three Pagodas have been symbolic constructions of the ancient Dali City. Afterwards you will visit the primitive and tranquil Dali Old Town, where you will enjoy limpid streams passing through the town and local people wearing their ethnic costumes. A street that goes through the South City Gate to the North City Gate is now a prosperous market street, selling marble, tie-dyeing and other souvenirs. 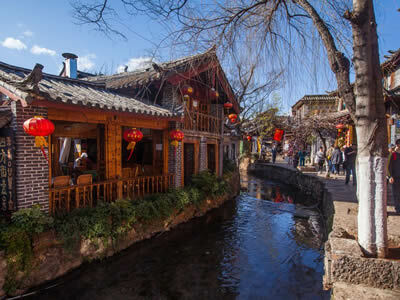 When the day draws to its end, you will visit ancient Lijiang town includes the Black Dragon Pool (Heilong Tan), an UNESCO World Heritage site, walk down the cobblestone streets over 700 years and see the Naxi way of life which changed little over time. The view of the massif from the gardens at the Black Dragon Pool (Heilong Tan) in Lijiang is noted as one of Chinese finest views. 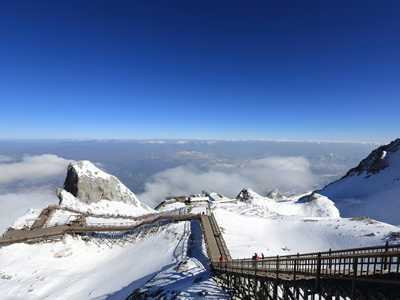 The mountain is the most southerly year round snowcapped mountain in the Northern Hemisphere and with its natural unspoiled beauty it draws a great many scientists, as well as visitors from both home and abroad. 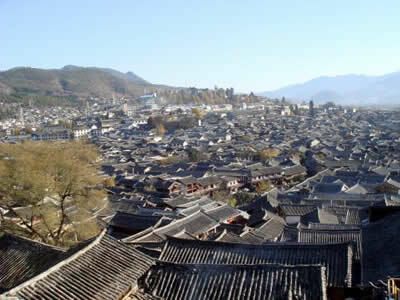 Lijiang town was constructed around 1000 years ago. In 1278, the Yuan Dynasty appointed the Naxi chief Mu De hereditary ruler of the area, and the Mu family retained power for about 500 years. Today their palace is one of the major tourist attractions of the old town. 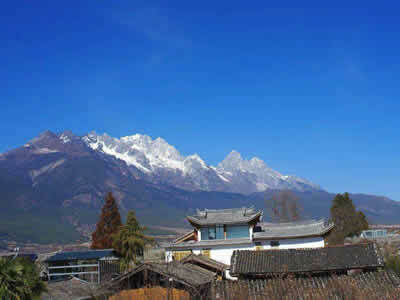 In the morning, we will firstly drive for around 60km/1.5 hours from Lijiang to the Tiger Leaping Gorge. On the way, you will have a short stop at the First Bend of the Yangtze River for taking some photos. After that continue to drive, you will arrive at the Tiger Leaping Gorge. As the heart of the Three Parallel Rivers of Yunnan Protected Areas, the UNESCO World Heritage Site, the Tiger Leaping Gorge is between the Yulong Snow Mountain of Lijiang and the Haba Snow Mountain of Zhongdian (Shangri-la area), and one of the finest treks through some of the most naturally beautiful and diverse landscapes China has to offer. The movement of the earths crust caused the Jinshajiang River (Upper reach of Yangtze River) to change its course. When the river flows to where the gorge is, its banks suddenly narrows, the narrowest point being only 20 m in width. From the peak of the Jokul on the west bank to the river there is a drop of 3,900 m, thus making it one of the deepest canyons of the world. 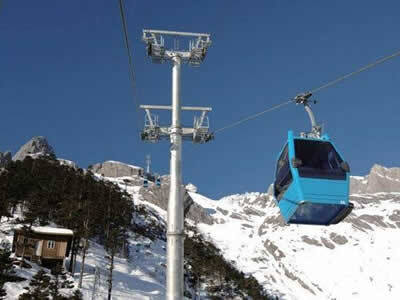 With a length of 16 km. it is divided into the upper, the middle and the lower sections, having 18 rapids. A huge square stone, Tigers Leaping Rock, stands in the river. The rivers swift currents, racing like a thousand horses, with cataracts pounding the banks, are awe-inspiring and spectacular. It was given the name, according to the legend, because a hunted tiger made his excape to the other side of the gorge in a single leap. After the tour here, continue driving for another 2.5 hours to Shangri-La, a place with stunning scenery, the azure sky and the hospitality of unsophisticated people. When arrival, Visit the ancient Dukezong Town, the old town of Shangri-la. Today in Shangri-la, you will begin your exciting tour with a visit to the Sumjtseling Monastery, the largest Tibetan Buddhist monastery in Yunnan. 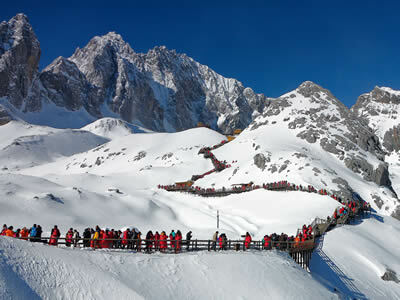 Then visit Potatso National Park. Makes up of the Wetlands of International Importance Bita Lake Nature Reserve and the "Three Parallel Rivers" world natural heritage Red Hill Area’s Shudu Lake, the park is 22 km away from the Shangri-La county town, with a total area of approximately 300 Square kilometers. 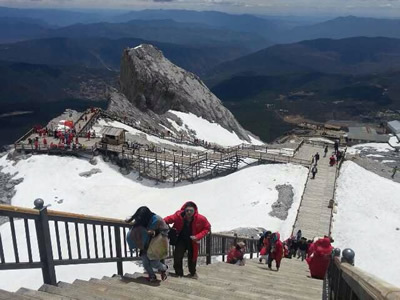 The park is in Northwestern Yunnan Province’s alpine cold temperate coniferous forest vegetation zones with altitude from 4159m in the northern peak of Militang Mountai to 3200m in the east of the Bita Lake. Potatso National Park is the first national park in China, which set environmental protection, ecological and cultural tourism. The region of this park contains more than 20 percent of the country’s plant species, about one-third of its mammal and bird species and almost 100 endangered species, though it comprises only 0.7 percent of Chinas land area. It is notably home to vulnerable Black-necked cranes, many rare and beautiful orchids, and Himalayan Yew, a coniferous tree whose extracts are a source of the anticancer drug, paclitaxel. Summer scenes inside Potatso Park are so intoxicating that one will call it the home for meconopsis, primrose, rhododendron, spruce, fir, birch and other treasured plants. Lots of wild lives live in the park such as wild boar, musk deer, leopard, pheasant, and different species of birds. Potatso is the transliteration of “Mandala” or “Putuo” which refers to a sacred mountain of Avalokiteshvara (Goddess of Mercy).“Putuo” or “Puda” means a boat to ferry people from sufferings. “Cuo” or “Tso” in Tibetan refers to a lake; so Potatso together means “Boat Lake”. Potatso used to be the original Tibetan name for Bita Lake where we can see an isle called Mandala or Mantuluo. Potatso is an unearthly world without pollution, far away from the bustle and hustle world. Bid a fond farewell to Shangri-la and be transferred to the airport for the flight to your next stop.